Preheat the oven to 200°C/gas mark 6. Line a baking sheet with non-stick baking paper. Remove the outer skin from the Brussels sprouts and chop in half. Add these to a medium-sized mixing bowl along with the sweet potatoes, onions, 2 tablespoons of oil, the maple syrup and a pinch of salt and pepper. Remove the leaves from half of the thyme sprigs and add those too, mixing well. Spread the veg out on an unlined baking tray and roast in the oven for 30 minutes. Remove from the oven and set aside. Roll the pastry sheet out and cut as large a circle out of the pastry as you can. Put the pastry on top of the lined baking sheet. On the pastry circle, gently mark but do not cut through an inner circle using a medium-sized bowl and a sharp knife. Cut a cross into the centre circle, leaving four equal wedges of pastry that are still attached to the main circle. Now make two more cuts, this time at an angle, leaving eight little equal-sized wedges that are still attached to the main circle. 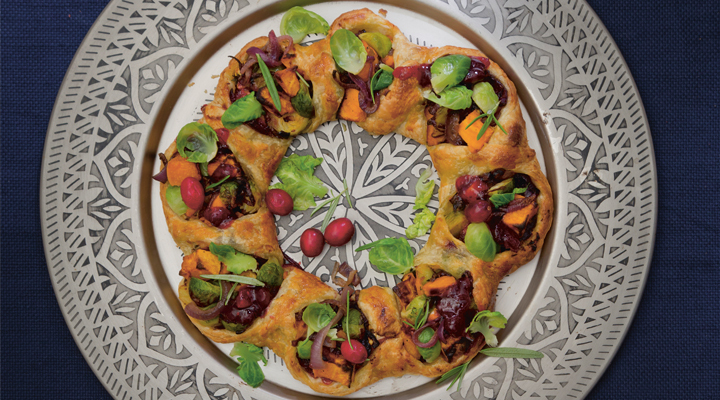 Spread the cranberry sauce around the main circle of pastry, then top with the roasted veg and the remaining thyme leaves. Bring one point of the centre star over the filling as well as bringing the outer edge of pastry inwards. Press the two together and continue until you have a wreath. Using a pastry brush, brush the wreath all over with oil. Bake in the oven for 15 minutes, until golden brown and cooked through. Remove from the oven and allow to rest for 5 minutes before cutting into slices.